Definizione e Ridefinizione dellInfarto Miocardico Acuto U.O. 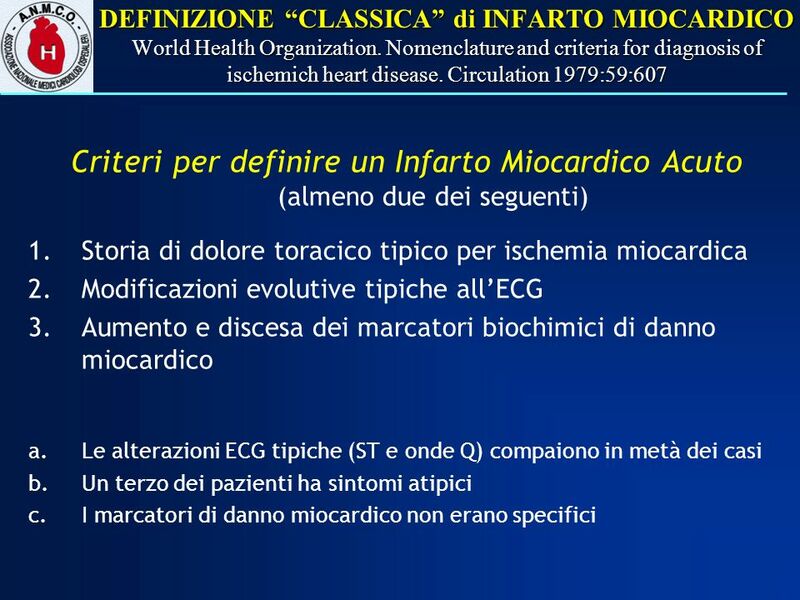 Cardiologia – Azienda Ospedaliera S.M. Misericordia - Udine Antonio Di Chiara CORSI LEARNING. 6 E SUFFICIENTE UNA SOLA DEFINIZIONE ? 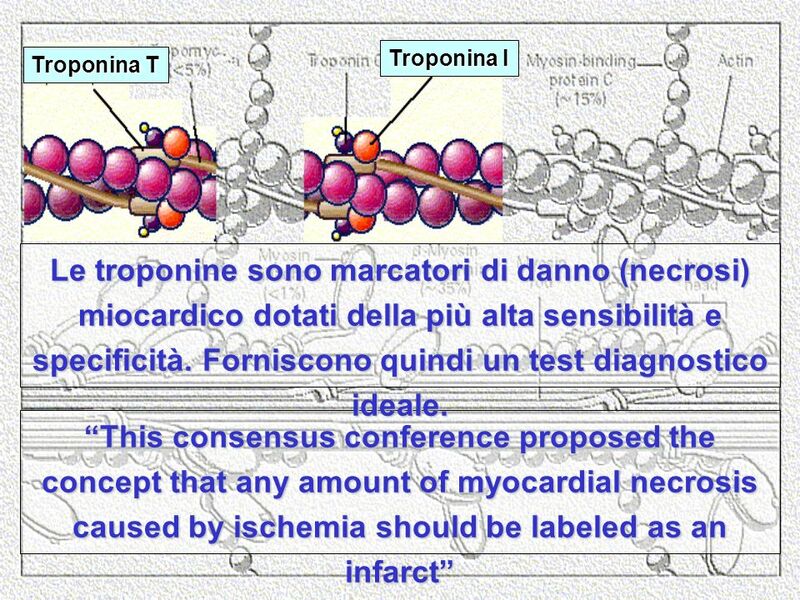 10 Troponina I Troponina T This consensus conference proposed the concept that any amount of myocardial necrosis caused by ischemia should be labeled as an infarct Le troponine sono marcatori di danno (necrosi) miocardico dotati della più alta sensibilità e specificità. 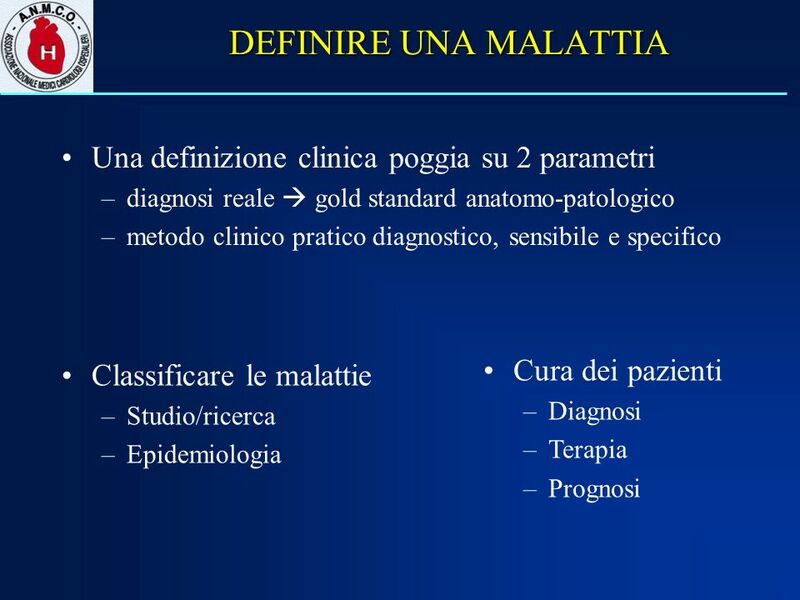 Forniscono quindi un test diagnostico ideale. 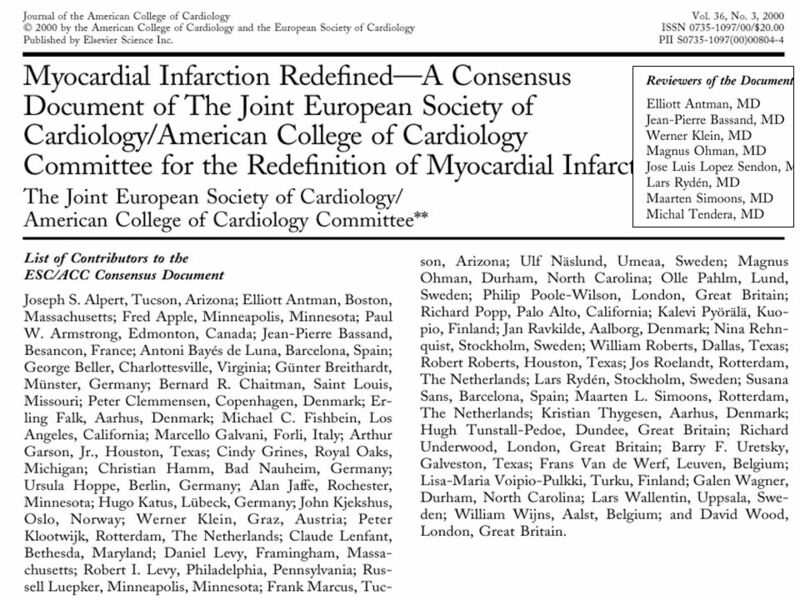 11 INFARTO MIOCARDICO RIDEFINITO A Consensus Document of The Joint European Society of Cardiology/American College of Cardiology. 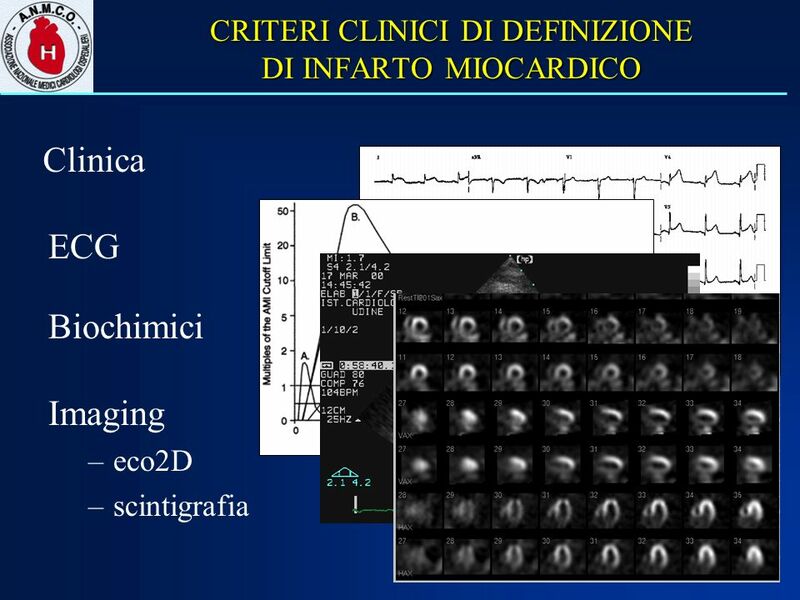 ( Eur Heart J 2000; 21: 1502 - JACC Vol. 36, No. 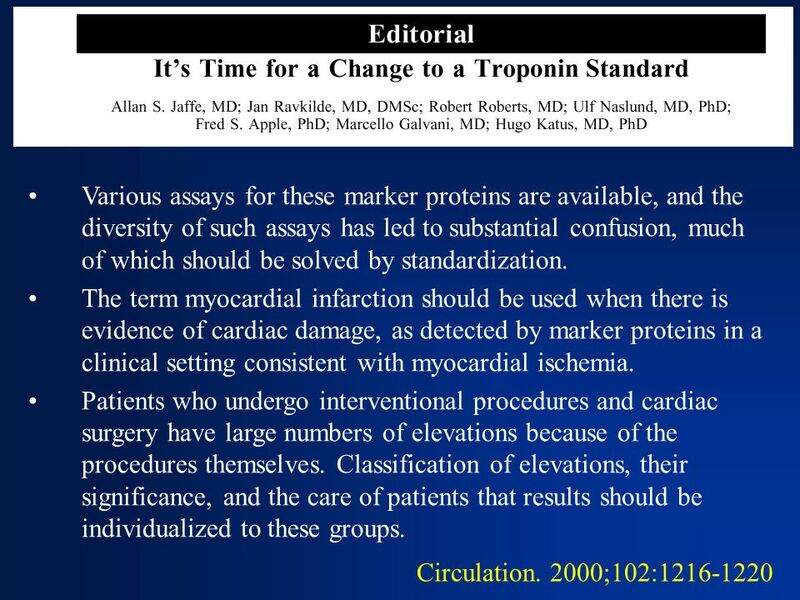 3, 2000:959) Criteria for acute, evolving or recent MI 1.Typical rise and gradual fall (troponin) or more rapid rise and fall (CK- MB) of biochemical markers of myocardial necrosis with at least one of the following: 1.ischemic symptoms; 2.development of pathologic Q waves on the ECG; 3.ECG changes indicative of ischemia (ST segment elevation or depression); 4.coronary artery intervention (e.g., coronary angioplasty). 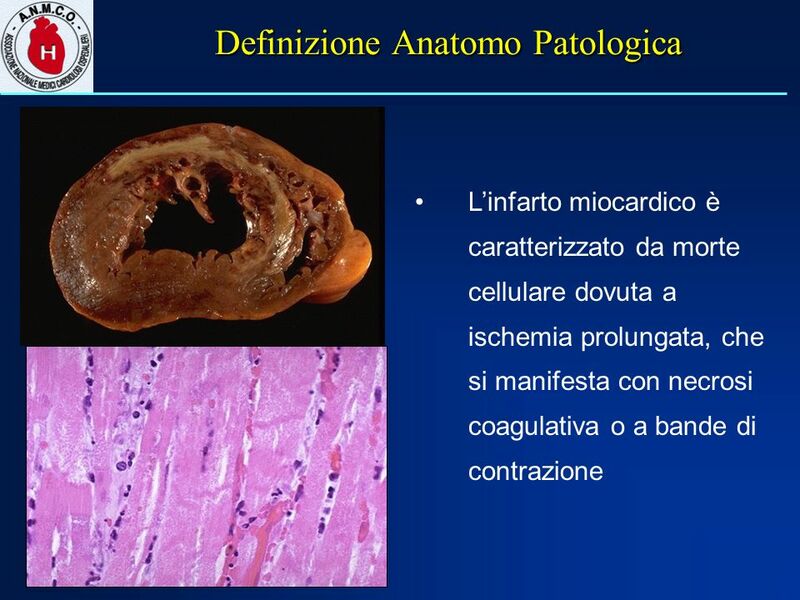 2.Pathologic findings of an acute MI. 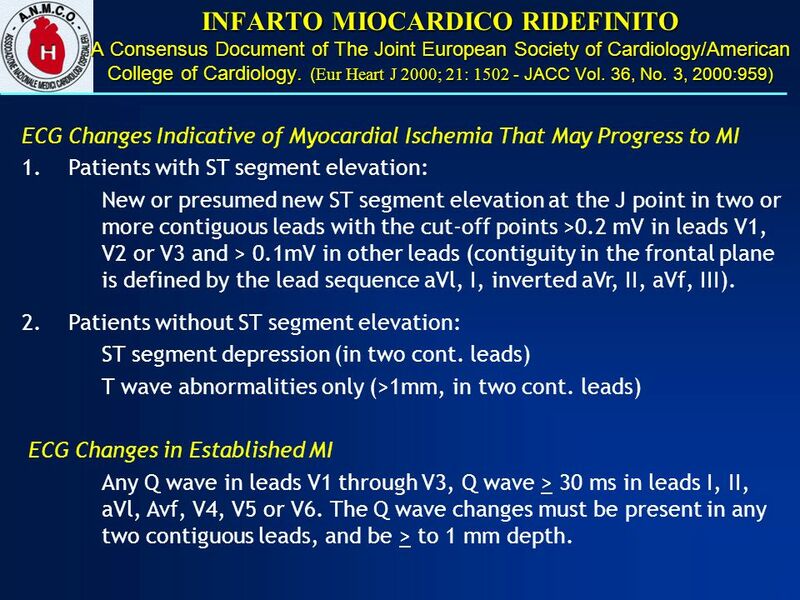 Criteria for established MI 1.Development of new pathologic Q waves on serial ECGs. The patient may or may not remember previous symptoms. Biochemical markers of myocardial necrosis may have normalized, depending on the length of time that has passed since the infarct developed. 2.Pathologic findings of a healed or healing MI. 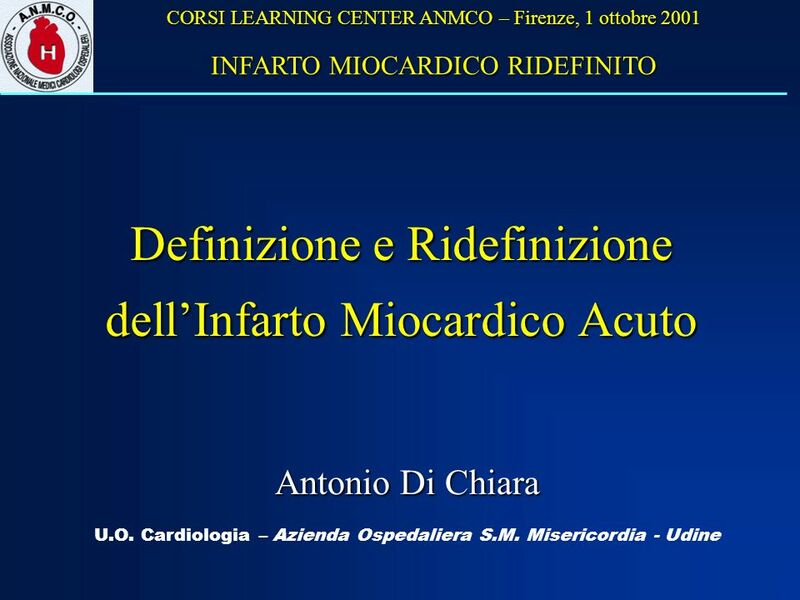 Download ppt "Definizione e Ridefinizione dellInfarto Miocardico Acuto U.O. 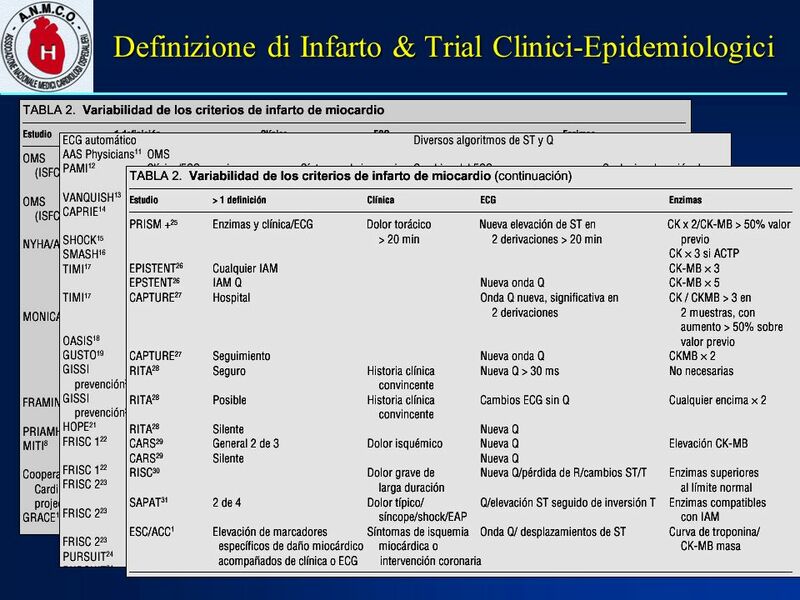 Cardiologia – Azienda Ospedaliera S.M. 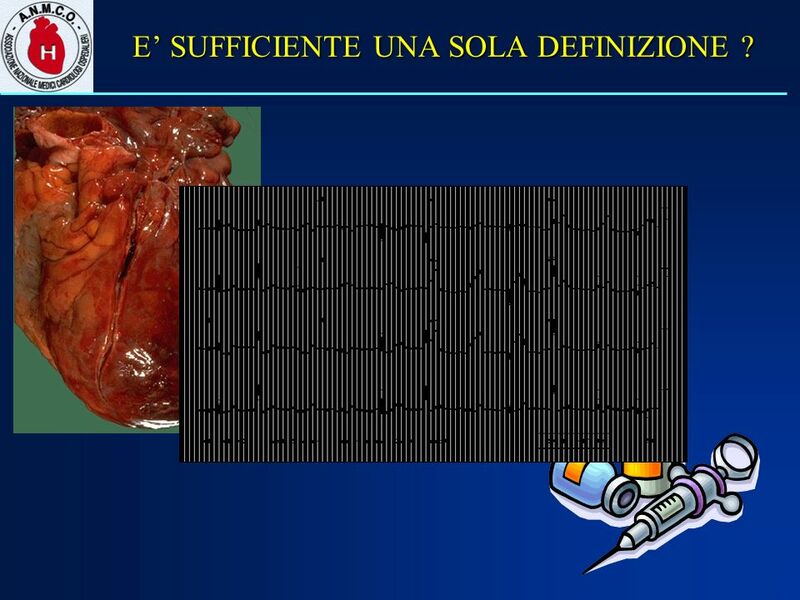 Misericordia - Udine Antonio Di Chiara CORSI LEARNING." 12-Lead EKG MEPN Level IV. AST in AMI CK in AMI electrophoresis for CK and LD isoenzymes INH for CK-MB RIA for myoglobin WHO criteria for AMI CK-MB mass. Name of the speaker: Germano DiSciascio I have the following potential conflicts of interest to report: Consulting Employment in industry Stockholder of. Off pump CABG has been performed for the first time 40 years ago. 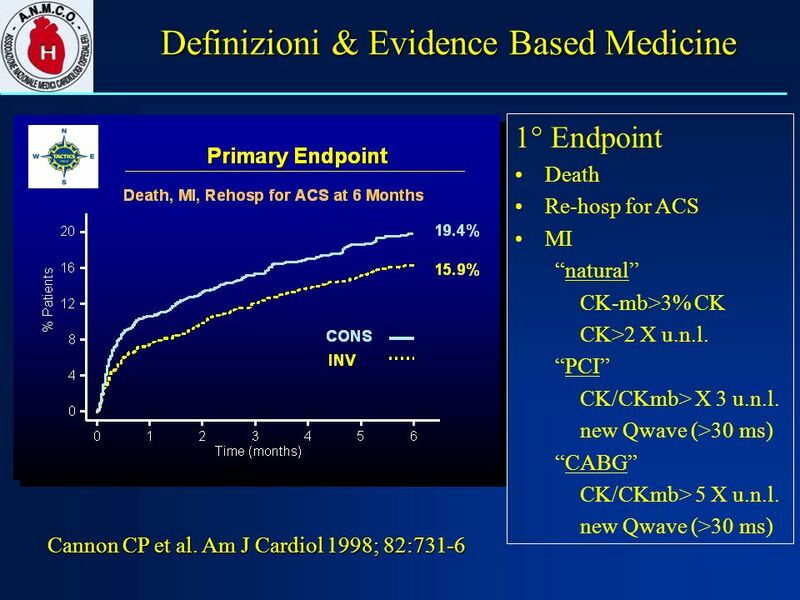 Although conventional CABG is considered both safe and effective, the use of CBP. 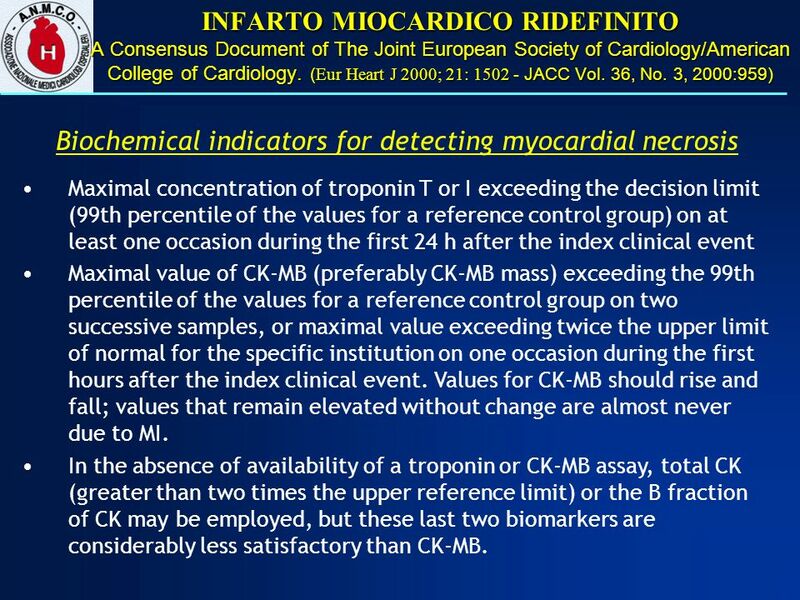 Biochemical Markers for Diagnosis of Myocardial Infarction. Pexelizumab for the Reduction of Infarction and Mortality in Coronary Artery Bypass Graft ll (PRIMO-CABG II) Trial Presented at The American College of. 1. What is the acute coronary syndrome? How big a health problem is the acute coronary syndrome? 1. 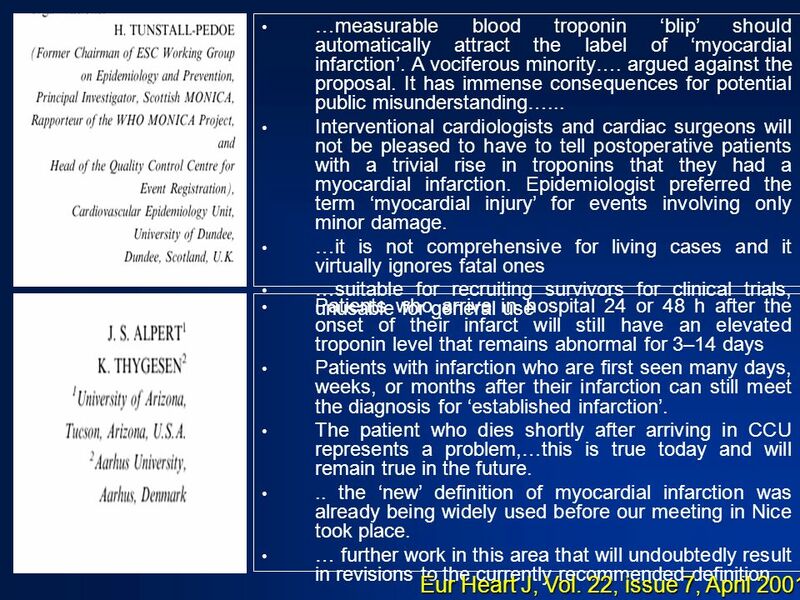 Copeptin and high sensitive Troponins Discussion of NEJM publications on sensitive Troponins BRAHMS GmbH, August 2010. Lecture 5. Infarction The process by which necrosis results from ischemia is called infarction Ischemic necrosis of myocardial cells is one of the commonest.